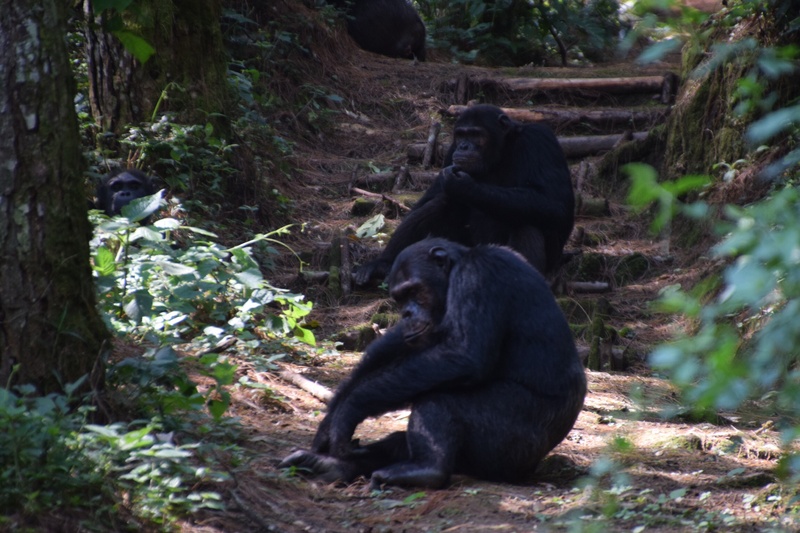 Whowhowhowhowhiwhowho… The sounds of chimps calling! At 4.23am the phone rings! This is our 4am wake up call – clearly attention to detail does not extend to the night shift. We have exactly 22 minutes to unpack, find and don our trekking gear, race along the path to the main block, down a cup of coffee and a pastry, pick up our brown paper bag – packed breakfast – and leap into our vehicle to meet our fellow Trekkers who depart the National Park headquarters, 15 minutes drive way, promptly at 5am. Phew! A few things forgotten… Insect repellent, sunblock, hats, cash to tip our walking guide… Hmmmm. 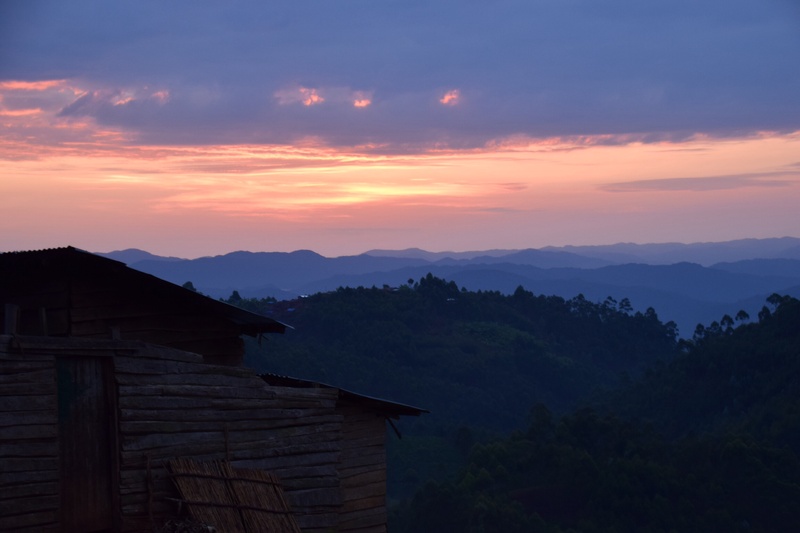 We do without the supplies, with no apparent ill effects, and Peter borrows cash from our driver, who is carrying around an even bigger wedge of local currency than we are (in part because he has somehow managed to acquire smaller RWF1,000 notes. As an aside, I am becoming confused by all the zeroes on the money here! Completely failed to correctly calculate that we were paying the equivalent of USD80 for a bottle of nice but not spectacular South African red wine at the hotel in Kigali… At least here in the lodge the wine list is already converted, although USD70 for a bottle of Edelrood – the cheapest on the list – is pretty rich! Mind you, I guess one should consider the challenge of getting it here (see previous post about the long road trip)! Anyway, back to our early morning start. Of course our convoy of 3 vehicles did not leave on time, despite being just seven guests…. us, an interesting slightly younger American couple from Ohio who have been in Madagascar to see the lemurs for her and are now in Rwanda to see the gorillas for him, and a trio of aloof (and much fitter than the rest of us) Belgian men of about our age. Just like the army, says Peter, hurry up to wait. I knew he would say that! We depart in due course, in pitch darkness. Light comes quickly on the equator, and when it does (about an hour later) we are still driving. Going into the Park by a different way, we are told, long drive. Packed breakfast – not that flash, they clearly don’t do “padkos” in Rwanda – consumed on the way. 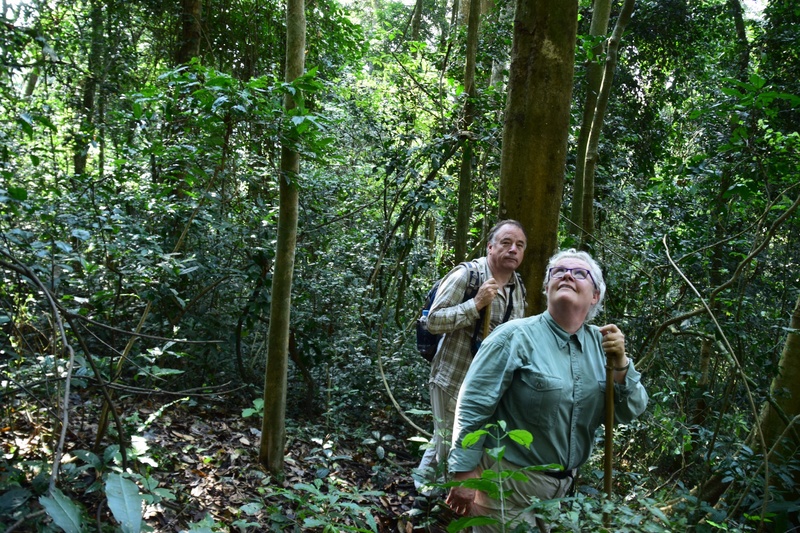 We disembark in a clearing in the forest – more like a jungle really, complete with Tarzan vines – for a briefing with our park ranger “my name is Hope”. 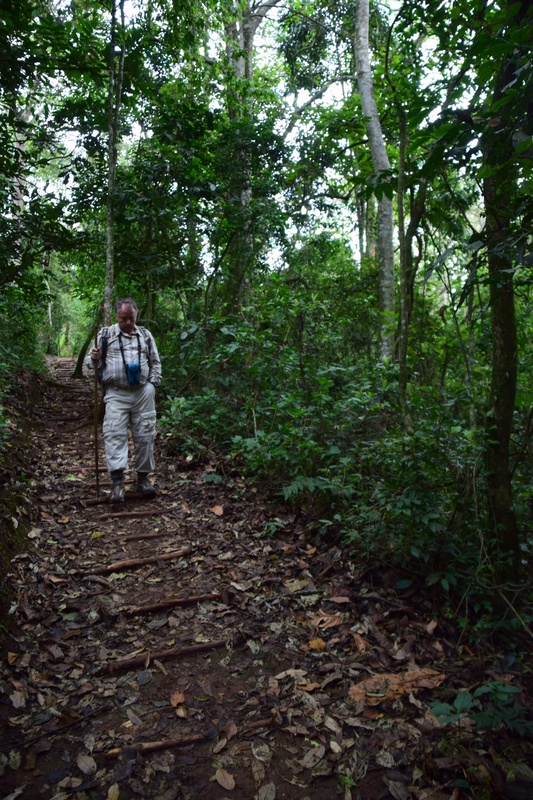 He tells us the trackers have found our chimps but he can’t say how long it will take us to get to them because they are on the move. We walk. We walk up, we walk down… Never flat. Peter’s knee is not happy with the down, my general fitness is left wanting on the up. We stop… I have an idea, says Hope, let’s take a short cut. Obviously designed to get us closer to our quarry, so we agree… NOT a good idea! Down down down the route plunges… Not a path, not a track, more like an erosion channel conveniently spotted by our guide as a potential way to get us down fast. I am terrified, and battling. Every second step I find myself slipping, the ground moving under my feet. Belgians stride on ahead. US couple going slowly but a little more competent. Peter very slow behind me – down is not good. Hope takes my hand – left me help you, he says. Put one foot here, then here, down we go, slipping and sliding. I can see where I’m going, sweat pouring into my eyes, glasses unable to keep hold on my nose… Just have to trust the guide. We make it! 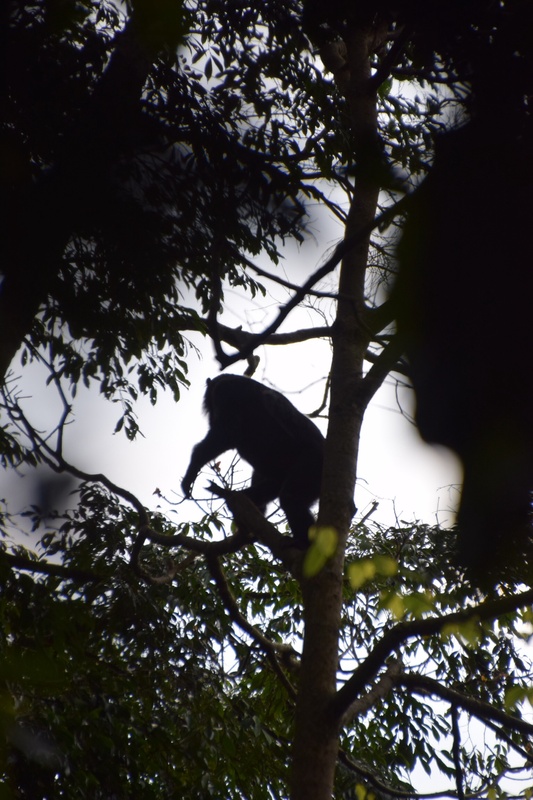 Muddy, exhausted… Never has so much sweat been expended going downhill… And suddenly it’s all forgotten… Our first sighting, there they are, up up in the trees, easy to see, hard to photograph. The next hour is spent following them, looping round to get ahead and below their route through the jungle. 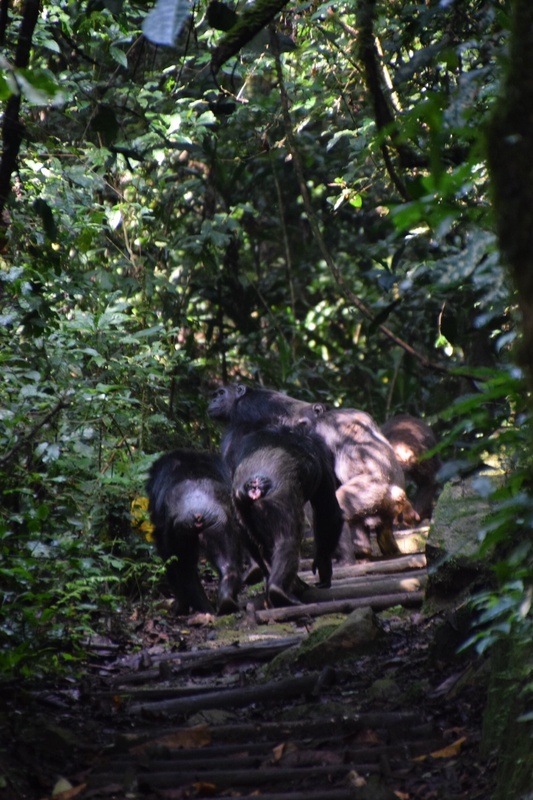 Then as if to tease us, they seem to decide that walking along the path, our path, is actually the easy route for them too… Between us, we snap hundreds of pics of the butts of a troupe of chimpanzees! The trackers stay with us – just as I’m straggling behind, the tail end tracker taps me on the shoulder. Look behind, he says. Sitting there, not 3m away from me, is a big male chimp… He is literally staring straight into my eyes. So human – I entirely forget to even raise my camera. Sometimes it’s the picture you take away in your head that is the most powerful. Did you get him, asks Hope? Yes I say (but not on my camera). Later he poses for us along the trail. 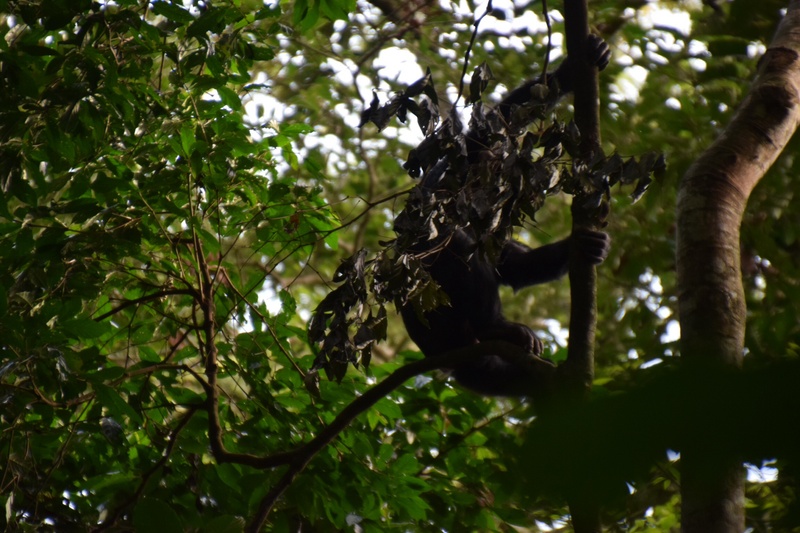 Then just as we are almost at the pick up point – another clearing where our driver is waiting for us – the chimps turn off the path and head back down into the bush. I am exhausted, but elated. I have been fortunate over the years to have many wildlife experiences, most all of them in vehicles of some sort. Tracking animals on foot is different, more frustrating and certainly more personally challenging. Perhaps that’s what makes it all the more rewarding, that you have literally sweated to find your prey. Or maybe it is just these animals – chimpanzees – so unmistakably human not just in their looks, but in their mannerisms, in the way they look at you, in the way they move together taking care of each other and looking out for the young ones. 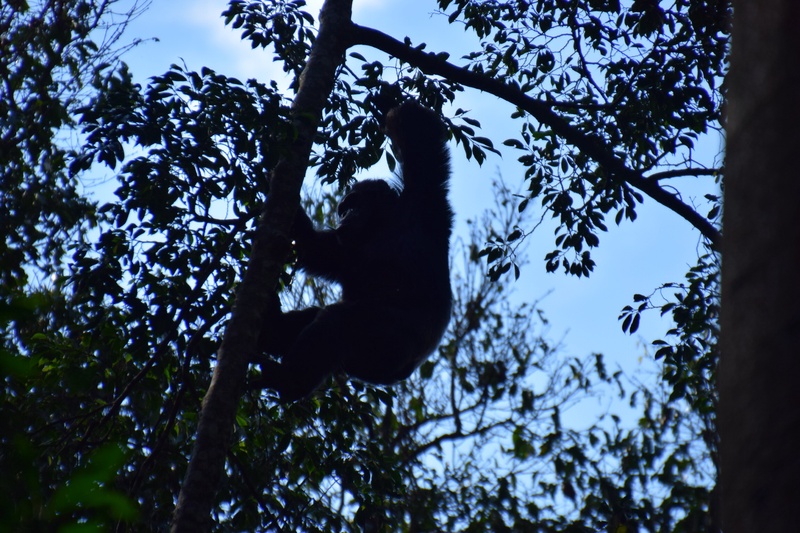 We watched a mother climb down from her tree to show a juvenile how to get up to the tree the rest of the family were in… Human cousins indeed. ← After the long flight, a long road trip!